A picture taken on February 8, 2019 shows people walking by placards depicting Ukrainian entertainer and presidential candidate Volodymyr Zelensky and oligarch Ihor Kolomoyskyi, looking out from his back, and reading ‘Servant of oligarch, doll of oligarch’ is seen glued prior to Zelensky performance in western Ukrainian city of Lviv on February 8, 2019. “The source of his popularity is that he does not belong to the establishment, and has been conducting an unorthodox election campaign,” according to Tadeusz Iwanski, research fellow at Warsaw-based think-tank, the Center for Eastern Studies. “Zelenskiy communicates with voters by using social media and holding concerts in Ukraine’s regional centres, while the TV series and cabaret shows in which he stars are among the most popular in Ukraine,” Iwanski said in a note last week. 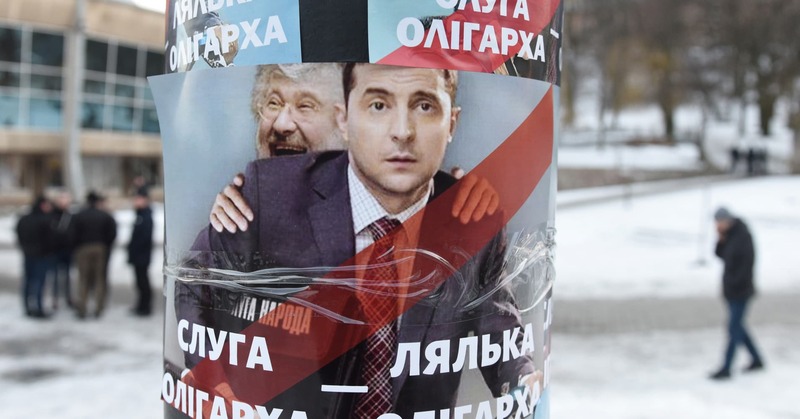 While Zelensky’s popularity has sharply risen in recent weeks, fueled largely by public dissatisfaction at the traditional political elite, analysts are keen to point out that his support base might be unstable. They also note that his policies and program for government are unclear. Otilia Dhand, senior vice president at Teneo Intelligence, said for Zelensky to pass into the crucial second round of voting he will have to offer a more detailed manifesto. “Given that Zelensky does not have a well-defined program, policy implications of his potential victory are difficult to gauge for now. It is likely that ahead of the second round, Zelensky would put forward a more detailed policy plan. 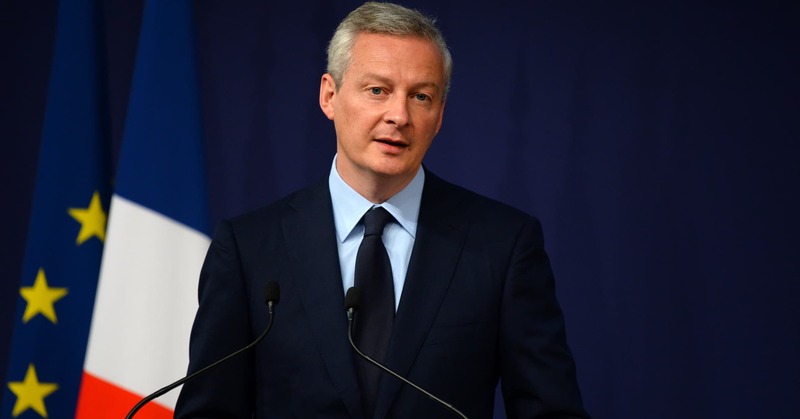 Meanwhile, the main concern is his lack of political experience and questions over his ability to steer the unwieldy Ukrainian political system to deliver reforms, including those required under the current IMF arrangement,” Dhand said in a note last week. A government led by an inexperienced politicians could be a big problem for Ukraine, a country largely reliant on foreign donors and an aid program from the International Monetary Fund (IMF). In December, the IMF approved a new 14-month near $4 billion loan that replaced a four-year $17.5 billion aid package agreed in 2015. That aid came after Russia annexed Crimea from Ukraine in 2014 and then supported a pro-Russian uprising in the east of the country, prompting the economy to decline as investors feared further instability. The IMF’s latest loan comes with four main conditions; that the government continues an ongoing fiscal consolidation to keep public debt on a downward path; reduces inflation while maintaining a flexible exchange rate regime; strengthens the financial sector; and advances structural reforms to improve tax administration, privatization and governance. Qualcomm expects incremental earnings per share of $2 as product shipments ramp, the company said. The two companies started proceedings in a trial in federal court in San Diego on Monday, which was expected to last until May. Both sides were asking for billions in damages. The antitrust case was originally filed by Apple in early 2017. The complicated legal battle centered around modem chips and related disputes been raging in courts around the world for the past two years, including an earlier trial between Qualcomm and the U.S. Federal Trade Commission. For years, Apple bought modem chips from Qualcomm, but it chafed under Qualcomm’s prices and requirement that any company using its chips would also pay licensing fees for its patents. Apple argued that Qualcomm was abusing its position as one of the only suppliers for cellular technology, and Qualcomm contended that Apple was withholding payments that the two companies had hammered out as part of a royalty agreement. According to Qualcomm, the license between it an Apple as part of this agreement is six years, with a two-year option to extend. It includes a one-time payment from Apple to Qualcomm. In November, Qualcomm CEO Steve Mollenkopf said that he believed that the two companies were on the “doorstep” to settling. Apple CEO Tim Cook contradicted him shortly after, saying that Apple hasn’t been in settlement discussions since the third calendar quarter of 2018. New iPhone models released in 2018 used Intel modem chips, instead of Qualcomm’s technology. Analysts had also worried that the dispute between Qualcomm and Apple could slow down Apple’s plans to support next-generation 5G networks. 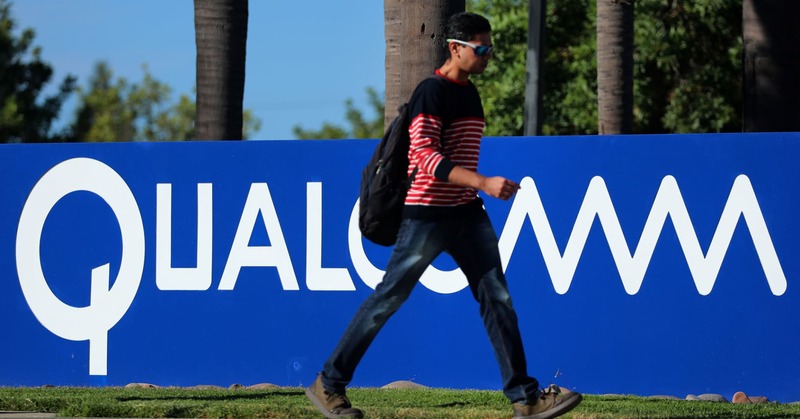 Qualcomm is one of the top suppliers of chips that can connect to 5G networks. Qualcomm and Apple® today announced an agreement to dismiss all litigation between the two companies worldwide. The settlement includes a payment from Apple to Qualcomm. The companies also have reached a six-year license agreement, effective as of April 1, 2019, including a two-year option to extend, and a multiyear chipset supply agreement. Germany’s biggest airline Lufthansa posted a loss for first three months of the year, hurt by rising fuel cost and overcapacity in Europe. The company said in a statement on Monday evening that adjusted earnings before interest and tax (EBIT) fell to -336 million euros (-$380 million), compared to 52 million euros a year earlier. 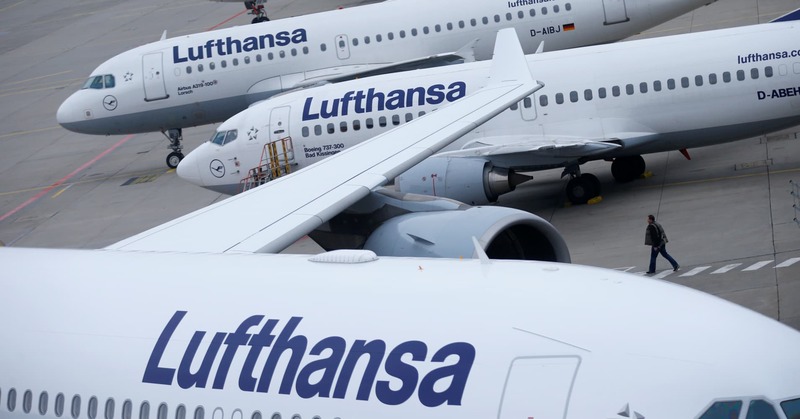 Earnings were hit by a 202-million euro rise in fuel costs, as well as a strong comparison to the previous year when the airline benefited from the loss of capacity due to Air Berlin’s insolvency, Lufthansa said. The airline said it expected unit revenues at constant currency to increase year-on-year in the second quarter, helped by favorable booking levels and a clear slowing of the market-wide capacity growth. For 2019, Lufthansa said it still expected to report an adjusted operating profit margin of 6.5-8.0 percent. Shares of the airline were indicated to open 5.5 percent lower in premarket trade on Tuesday morning at 0535 GMT.